due to changes in the battle.net api future releases of this module will require an apikey from blizzard. its a very easy process and only has to be done once as the apikey will be cross compatable with the other battle.net api blocks. 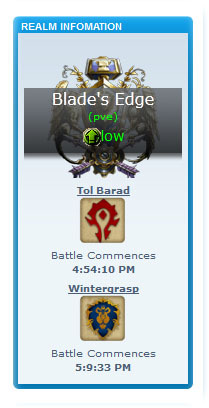 these blocks will NEVER REQUIRE a person to login to battle.net to view the contents of the block. the apikey is just a onetime thing that will require you to input a code into the ACP for the block once you have received it.